Elsie Wheeler was born Elsie May Wheeler on September 3, 1887 at 9:39 pm in Norris City, Southern Illinois. Not a great deal is known about her life, but the legacy she left behind lives on through the gift that is the Sabian Symbols. Severely afflicted with rheumatoid arthritis, she spent her entire life in a wheelchair. 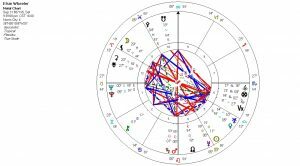 Even though the Sabian Symbol for her Sun is Virgo 12: A Bride With Her Veil Snatched Away, Elsie never married nor had children. It seems she may have been “wedded” to a higher spiritual purpose. Her “Veil” seems to be firmly in place as not much has been recorded or written about her. I have spent many many hours over several years researching genealogy records in an effort to find out as much as I could about her. I had not been able to find a photo of her until relatively recently when I found one attached to her obituary (pictured left) in San Diego’s Union newspaper, but it was not very clear. Still, I was very grateful to find a picture of her at all. Elsie, born in southern Illinois in 1887, was the youngest of 5 children. Her siblings’ names were Ada, Cora, Edward and Charles. The family lived in Mayberry in Hamilton County,and also in Norris City in White County. Her mother’s name was Louisa and her father’s name was Willis. She was left an orphan after her mother died in 1891 and her father in 1894. Her maternal grandmother died in 1895, her sister, Cora, died in 1902, Cora’s husband, Henry Wakeford, died in 1905, and their daughter (Elsie’s niece) died in 1900. Cora, however, had another child, Suzanne, who became very close to Elsie in her later years. Confined to a wheelchair her entire life with rheumatoid arthritis, in the 1900, 1910 and 1920 US Census, Elsie is listed as being at the Bethesda Hospital and Home For The Incurables in St. Louis, Missouri. She was in the Home for the Incurables for almost 30 years. She moved to San Diego some time early in the 1920’s, from my research it seems she moved there in 1923 (when she was 36) living with a man listed in the 1930 Census as being her uncle – Frank W. Baxter. From the San Diego City records, Frank and Elsie lived in India Street, Washington and Market Street in Mission Hills at various times. In the 1930 Census, Frank was listed as being a barber and Elsie a spiritualist medium. Although Frank was described as her uncle in the 1930 Census, it appears that he was not really her uncle as there is no family connection that can be found. My feeling is that they were listed as niece and uncle as this made their relationship sound more respectable – times then being what they were around these kinds of issues. 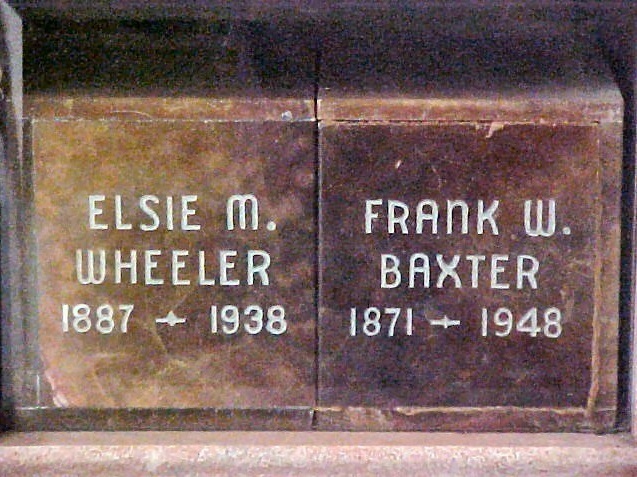 Elsie lived in San Diego with a man named Frank Baxter. My mother married a man named Ian Baxter when I was 7 and, at the age of 10 and 11, I wanted to change my name by deed poll to Baxter. Many years later, my mother married again, this time to a man named Frank. Elsie’s maternal grandmother was Helen Hill. When I gave birth to my daughter, Jessica, in 1983 – some years before I got into studying the Sabian Symbols and many years before investigating Elsie’s family, my ex-husband and I named our daughter Jessica Helen Hill, and wondered why we were giving her the name Helen. I well remember thinking that one day I’d know why we gave her the middle name of Helen. When I found that Elsie’s grandmother’s name was Helen Hill, I was quite amazed. Frank Baxter died after being hit by a bus in San Diego in 1948. It may sound a little disrespectful, the thought used to cross my mind about the first guy I was attracted to in my teens, who was not an attractive man, looked like he’d been ‘hit by a bus’…. for some reason that expression came to mind several times over the years. Elsie become quite famous in San Diego through being a spiritualist medium. She regularly advertised in the San Diego Union that she was seeing clients at her home. Just some six months before her death, Elsie took a trip back east. 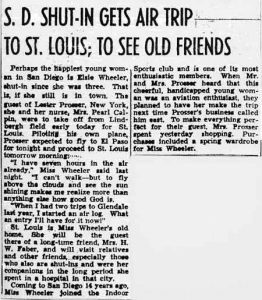 The following article appeared in the San Diego Union newspaper on March 16, 1938 edition; page 4 column 2. St. Louis is Miss Wheeler’s old home. She will be the guest there of a long-time friend, Mrs. H.W. Faber, and will visit relatives and other friends, especially those who also are shut-ins and were her companions in the long period she spent in a hospital in that city. From my research, it appears certain that Elsie did not make it to St. Louis or Norris City on that trip as there was a very destructive hurricane that hit St. Louis on the day she was supposed to arrive. Instead, she apparently spent the time with her niece, Suzanne Wakeford Steitz, in Chicago. 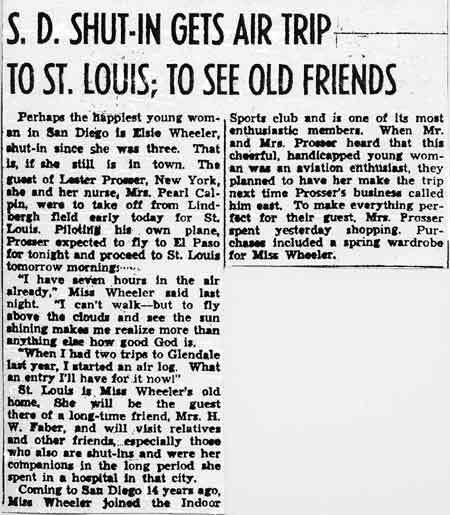 The following was a news story published in the San Diego Union newspaper on Nov. 27, 1938. “Although confined to a wheelchair all her life, Miss Elsie Wheeler, 51, who died in a local hospital yesterday, had a beaten path to her door, made by men and women in all walks, who sought her advice, and particularly her perpetual smile. She was an ordained minister in the Spiritual faith. Elsie Wheeler’s death cast a gloom over many hundreds of men, women and children, who knew her intimately. This heroic woman’s hands were so badly afflicted with arthritis she could not shake hands with those who adored her. In making the rounds at Indoor Sports social affairs to greet members, I always touched her hand. I felt better for having touched her twisted hand; it was like mending something through my body and into my heart. She was just that type of person. At Elsie’s cottage, 130 Washington St., bankers, lawyers and even the lonely gardener come to see her about their problems. Many were downhearted. They were seeking a way to see a brighter side of life. Elsie, sitting in her wheelchair, smilingly pointed the way. Many profited from her advice and counsel. Elsie died at the age of 51 in San Diego on the 26th November 1938. 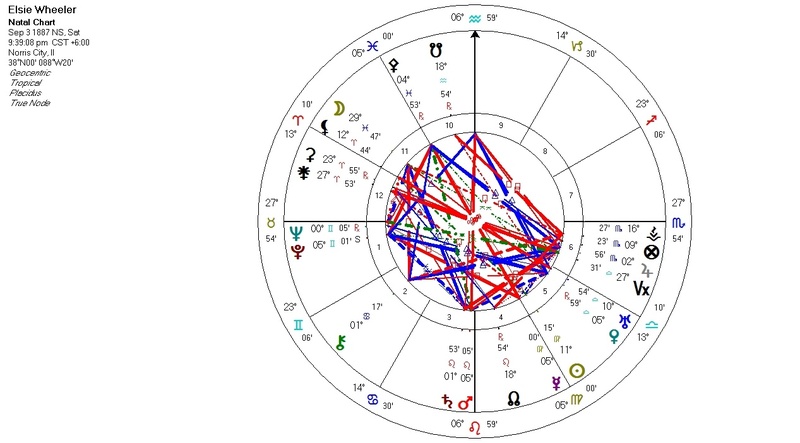 At the time of her death, her progressed Sun was at Scorpio 2: A Broken Bottle and Spilled Perfume. She could stand the pain no longer and she left her physical body. The beauty and grace with which she lived her life is enhanced by the gift she has given to the world. Indeed, as Ralph Waldo Emerson said, “To finish the moment, to find the journey’s end in every step of the road, to live the greatest number of good hours, is wisdom”. Thanks to Paul Newman for linking this quote to Elsie Wheeler. You can see all Elsie’s Sabian Symbols in Notable Charts, one of the tools available to premium members.